The children that roam my house are ages five and two. These children eat and eat and eat. Always throwing food at their faces, most of the time the food makes it in their mouth. As a Mom that loves them, I prefer they eat healthy snacks, fruits and veggies. Crunch Pak makes this easy! Crunch Pak is the industry leader in fresh sliced apples. Founded in 2000, Crunch Pak is committed to providing the highest quality organic and conventional sliced apples in the market. Crunch Pak’s family of brands include Crunch Pak, Crunch Pak Organic, Disney / Crunch Pak. Annually Crunch Pak creates more than 1 billion apple slices at plants in Cashmere, Washington, and Pennsylvania. My family was able to try two varieties of Crunch Pak. 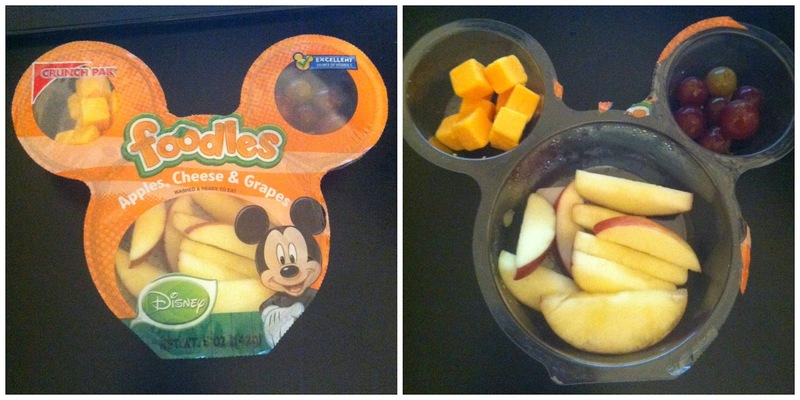 My local Target carries the Sweet apple Slices with Sweet Seedless Grapes and the Disney Foodles. Both are great products, easy to take on the go or eat while hanging out at home. As the Mom, I enjoyed the Sweet apple Slices with Sweet Seedless Grapes the most out of these options. One little bag is perfect to satisfy a sweet tooth and add a little substance to your body to keep going. Inside one of these packages, you'll find exactly what is stated in the title. Sweet apples and sweet seedless grapes! The children loved the Disney Foodles the most. They are in the shape of everyone's favorite mouse and have a little something extra waiting for you! Inside a Foodle package, you'll find apple slices, sweet seedless grapes and cubed cheese. Crunch Pak is perfect for snacks at home and on the go! They're perfect for moms, daughters, dads, sons, grandmothers, anyone that wants a little healthy snack! You can pick up Crunch Pak at your local grocer, but check out their website to find out what other products they offer! So many more than what we are talking about today! Disclosure: A special thank you to Crunch Pak for giving Sweet Cheeks and Savings this opportunity to work with them. We received these items free of charge from Crunch Pak. No monetary compensation was received or offered, nor were we under any obligation to write about this product. All opinions expressed are honest thoughts. We were not offering any sales or taking orders for this item. We will not receive any compensation in connection with any sales of this item. We get these for when we are traveling, or going to the zoo! Kids love em and so do i! These would be nice to bring to work for a quick snack in the middle of the work day. My boys would LOVE those Disney Foodles. When we go to Disney World every year, they get so excited to eat off of Mickey shaped plates LOL. I've never seen these before, they are so adorable. I love the apple slices, cheese and grapes. This would be great to have on hand while out and about! For kids and adults. These are yummy i eat them at lunch time a lot so good and good for you. We are big fAns of Apple slices. Even more if they come in Mickey slapped plates! We're on the go a lot, so we love finding snacks that are healthy and easy to eat while we're out and about. The Foodles would be a big hit! Oh I love the Mickey Mouse head snack pack! That is so stinking cute! Any kid would love to munch on those. My son loves the Mickey Shaped crunch packs, if he sees them he adds them to the grocery cart. My kids would definitely go for those Disney Foodles! I love the whole concept of making healthier foods more "fun" and appealing to kids. My kids love these snacks, especially when we are traveling! The Mickey shaped ones are too cute. I love that they are Mickey shaped and that they are healthy snacks! This is perfect for my kids' lunch and for on the go! I haven't seen them yet, but haven't known to look for them! I am definitely looking the next time I'm out! We tried these a while back and thought they were great. But, they're very hard to find inn my area, noone in like 30 miles carries them. What a great idea my granddaughter would love these she likes anything Disney. Those are yummy and healthy goodness! Oh where oh where have these been all of my life??? THIS Is the snack I want to send to school w/my kids, not the cakes, brownies, chips that are so easy to pick up and throw in there. How cute! I haven't seen these before, but I bet my son would love them. My kids used to live on those Foodles things. Now that they can eat actual apples, I haven't gotten them. Glad they're still around, though! I love apple slices! I have not seen these in store I will definitely keep an eye out for them. the container is so cute for the kiddies. Packaging healthy foods in a Disney carton would surely get my girls to eat more fruits and veggies! What a fabulous idea! I don't even had kids and I would buy those Disney Foodles! haha actually I think I have bought them before! I've seen these in stores but never tried them yet. My son would love them though, I'll have to grab one next time I'm there! This is such a fun snack for kids. I would love this myself. Wow, these are great! The Disney packaging is cute too and genius marketing. Love this. These look like great snacks to take on the go or on road trips. These are SO great!! My girls ask for them all the time!